Matt Crafton, driver of the No. 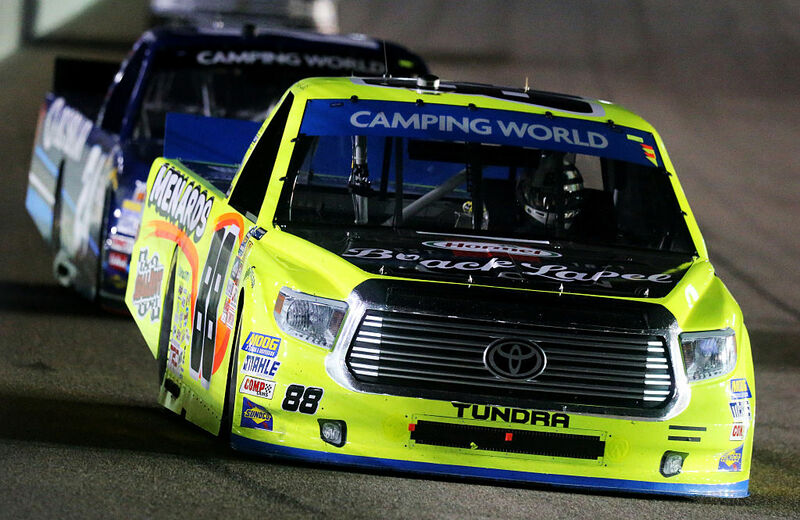 88 Black Label Bacon/Menards Toyota Tundra, made his 16th career start at Homestead-Miami Speedway (HMS) in Friday night’s NASCAR Camping World Truck Series (NCWTS) season finale. As one of four drivers competing in the inaugural Championship 4 Chase, Crafton entered the 134-lap race as the only past champion, looking for his third title since 2013. Starting seventh, the ThorSport Racing driver showed his strength throughout the 134-lap event. Battling a Menards Toyota Tundra that was, “free-in.” Crew chief Carl “Junior” Joiner brought the No. 88 machine to pit road four times throughout the night for four tires, and fuel. Crafton, who led the field three times for 10 laps, and was the only Chase driver to lead the field, restarted second following his final pit stop of the night, with 20 laps to go. In the final 20 laps, an intense battle on the race track with fellow Chase driver, Johnny Sauter heated up, and Crafton’s Menards Toyota Tundra swung to the tight side, forcing the ThorSport Racing driver to lose valuable track position, and ultimately a shot at the series title. Crafton would cross the stripe in the seventh position behind race winner, William Byron. The top-10 result was the Menards drivers eighth top-10 finish at the 1.5-mile track. Crafton closes out the 2016 season second in the Chase standings with two wins, eight top-five, and 16 top-10 finishes. What was the difference on that last run tonight? The NASCAR Camping World Truck Series (NCWTS) had two practice sessions on Friday morning at Homestead-Miami Speedway (HMS). Matt Crafton was fifth, and 15th, respectively, in both sessions. Making his 16th career start at HMS in the NCWTS, Crafton started fourth, led the field three times for 10 laps, and finished 10th. Crafton was the only Chase driver to lead laps in the 134-lap event. In 16 starts at HMS, Crafton has led 25 laps en route to six top-five, and 12 top-10 finishes. In 23 starts in 2016, Crafton has one pole (Atlanta), two wins, and has led 446 laps en route to eight top-five, and 16 top-10 finishes. Crafton, a two-time NCWTS champion finished second in the 2016 Chase standings for the 10th consecutive season. In 2016 Crafton extended the NCWTS record for consecutive starts to 384, passing four-time NCWTS champion Ron Hornaday, Jr with 360 starts in the 2015 NCWTS season finale at HMS. In 384 career NCWTS starts, Crafton has earned 12 poles, led 2135 laps en route to 13 wins, 97 top-five, and 226 top-10 finishes. Crafton’s ThorSport Racing teammates finished 13th (Rico Abreu), 16th (Cameron Hayley), and 20th (Ben Rhodes).